WASHINGTON (AP) — George H.W. 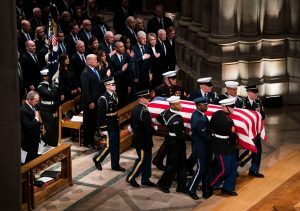 Bush was celebrated with high praise and loving humor Wednesday as the nation bade farewell to the man who was America’s 41st president and the last to fight for the U.S. in wartime. Three former presidents looked on at Washington National Cathedral as a fourth — George W. Bush — eulogized his dad.”To us,” the son said of the father, “his was the brightest of a thousand points of light.”After three days of funeral events in Washington, Bush was headed home to Texas for more ceremony and then his burial Thursday. After the cathedral service, the hearse and a long motorcade drove to the National Mall to pass by the World War II Memorial, a nod to the late president’s service as a World War II Navy pilot, then arrived at Joint Base Andrews.Cannon roared again, “Hail to the Chief” was played for Bush for a final time in the capital and the plane with his casket and Bush family members aboard took off for Houston. He died Friday at age 94.